Murakami is to the right, holding the second place trophy. Murakami made his first appearance in the competitive scene at the Summer 2011 Sendai Regional, in June of 2011. 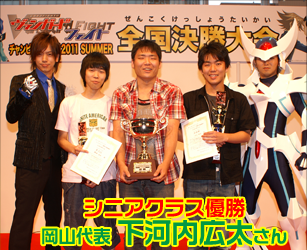 Taking first place with his Royal Paladin deck, he proceeded on to face Shitakawachi in the first ever national-level Vanguard competition, held in August. However, Murakami ultimately lost this fight, placing as the runner-up. It is unknown if he participated during the following Grand Prix; he has not appeared on official listings since then. Murakami is noted primarily for paving the way for much of Japan's competitive scene, as Sendai was the first ward of Japan to have a tournament. As such, its results were available ahead of the other tournaments. He's also recognized as one of the earliest advocates for the Royal Paladin clan, defining what are internationally known as its primary strategies with his first decklist. Ironically, the very strategies that Murakami originated became the basis for the deck that would defeat him in the Summer of 2011. His opponent in the final rounds of the Sendai tournament was Gotou Hirotaka. Unlike Murakami, Gotou advocated for a more heavily Alfred-centric build, using Bors for support in their fight. Murakami's strategy was to superior ride from Barcgal into Blaster Blade, building up the soul for Soul Saver Dragon's soulblast; High Dog Breeder, Akane and Pongal were additional support cards for his strategy. His grade 1s included just three copies of the Flash Shield, Iseult--typical for the time, as Murakami only ran 2 draw triggers--Lien for her deck-searching capability, Marron as a universal booster, and Lionmane Stallion to support a rearguard Alfred. As Lionmane was also a viable target for Akane, Murakami could take advantage of this to use Alfred to superior call Akane and Akane to superior call Lionmane, building up for the turn in which he would ride Soul Saver Dragon. Murakami's initial decklist included 3 copies of Blaster Blade, with one Gancelot to make up the difference--thus accounting both for the possibility of his Barcgal being retired, and that one may end up in the damage zone. While the build was somewhat rough for the time and likely ruled by budget, it was nonetheless able to either gain card advantage through superior ride and call, or else punish the opponent that attempted to break this advantage with retire skills. The revised deck Murakami brought to Japan's summer national was, unfortunately, not up to par. Between the two decks, Murakami removed one of his Soul Saver Dragons and ditched Gancelot in favor of an additional Blaster Blade. With just five grade 3s and Akane absent from the deck, he would theoretically be dealing with ride problems in the finals--whether this was actually the case or not is unknown. Murakami appears to have substituted out several of his key cards in favor of other, less useful units--cutting Akane for Randolf and additional Gordons, and Margal for another Flogal, the changes are drastic enough that it becomes ambiguous if this Murakami Kazuya is indeed the same Murakami Kazuya from Sendai. Murakami appears to have rather strangely cut the trial deck Marrons and Elaines in the transition, but on account of the identical kanji(there are around eight ways to write Murakami in Japanese, similar to the Fisher-Fischer shift in English) and the requirements for national participation, it must be concluded that these two cardfighters are in fact the same person.